The Bahamas Red Cross Fair moves to Clifford Park, Packed with Activities, Performances, Ministry of Tourism Sponsorship Bahamas Red Cross Unveils Plans for its 1st, 2-day Red Cross Fair with The Royal Bahamas Police Band, Junkanoo, a Taste of Junkanoo Carnival and so much more! Nassau, The Bahamas – Seventy-eight years after it first lured donors and families to a fair to assist with World War II relief efforts, the Bahamas Red Cross announced today it will break with tradition and stage the largest fair in its history – moving to a new location at Clifford Park and packing live entertainment into every hour of the two days. “We are re-imagining the Red Cross Fair, retaining the best of the traditional fair with food and games and crafts and more; but adding new elements that create excitement and appeal to people of all ages,” said Caroline Turnquest, Bahamas Red Cross Director-General. “If you attended the fair in the past, you won’t recognize it this year. “ Recently appointed Co-Chair, Mr. Dwayne Heastie is credited with bringing the vision of a more contemporary and modern approach to the fair. 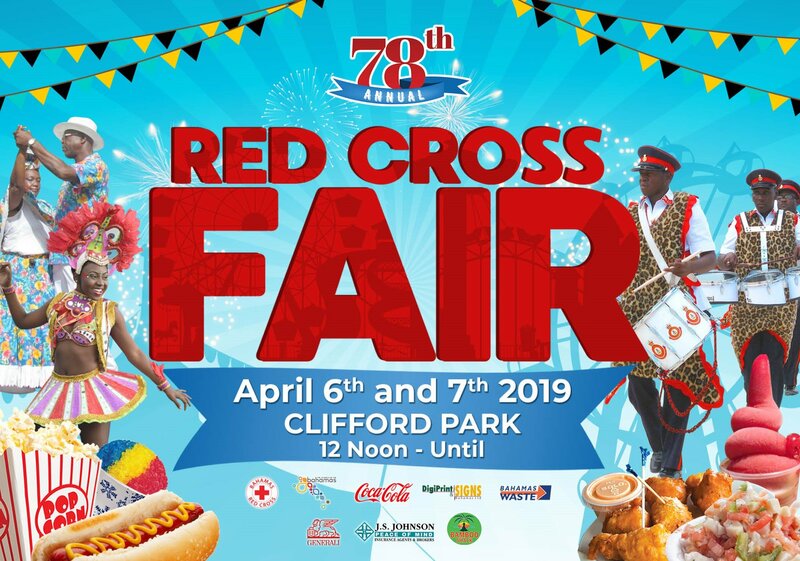 For the first time, the Red Cross Fair will run for two days; Saturday, April 6 and Sunday, April 7 with all events at Clifford Park—the first new venue after seven decades at Government House. The fair opens at noon on Saturday and runs until midnight with music throughout the evening, including performances by Geno D, Sammy Star, Rick Carey, Dyson Knight, Spank Band, Rhythm Band, Sonovia Pierre, Osano Neely, and Funky D. Both the Royal Bahamas Police Band and Royal Bahamas Defence Force Band will perform with the Defence Force expecting to share a musical tribute to Sir Sidney Poitier that they wrote for his recent 92nd birthday. 2 It has only been performed once before and the famed actor with Bahamian roots sent word on how moved he was. “This is the largest call of live entertainers in our history,” noted Dwayne Heastie, co-chair of the Red Cross Fair Committee. “In addition to all the other entertainers, we have a full slate of gospel music with live performances by Shabak, Bishop Denzil Rolle Ensemble, Ricardo Clarke, Pastor Trent Davis Ensemble, Karrington McKenzie, DJ Counselor, Clement Penn and Ayanna Clarke. This will be an event that people will talk about for years.” Major junkanoo groups are slated throughout the day on Saturday. The Red Cross provides assistance to almost every facet of the Bahamian community. “The Bahamas Red Cross Fair is our largest fund-raiser,” explained Ms. Turnquest. “We count on this event every year to help us maintain our feeding programs, provide assistance to those displaced because of unforeseeable events or natural disaster. There is almost no facet of the Bahamian community that we do not touch in some way whether through emergency assistance, temporary housing, tents, blankets, canned goods, even emotional support when fire or other tragedy hits and people have nowhere else to turn. That is when the Red Cross is there for them and we could not do what we do or provide the services we provide without the revenue generated by the annual Red Cross Fair.” Corporate sponsors provide much of the funding that keeps the organization heavily dependent upon volunteers operational. “We are tremendously appreciative to Corporate Bahamas,” said Turnquest. “But we also want the general public to appreciate all we do and that is where the fair comes in. So we are going to take the Bahamas Red Cross Fair which has long been a part of everyone’s calendar and turn it on its heels, making it the most fantastic cultural event of the season.” According to Exanna Dormeus, fair co-chair, the 2019 fair will also differ from past events in the way of sponsorship and vendor engagement. “For the first time, we have had the Ministry of Tourism come onboard as a sponsor because they recognize the opportunity this presents for visitors to interact with locals and to enjoy the Bahamian entertainment, culinary and cultural experience,” said Dormeus. Another first according to Ms. Dormeus is that vendors will be allowed to purchase booth spaces for a nominal fee and retain 100% of their proceeds. Unlike in the past where donations where split with the Bahamas Red Cross and the booth rentals were at no charge. Dormeus also extended profound gratitude to the other major sponsors of this year’s fair. Corporate sponsors include, Coca Cola, Digiprint, Bahama Waste, Generali and J.S. Johnson. News of the fair plans were revealed at a press conference at Red Cross headquarters, JFK, this morning.